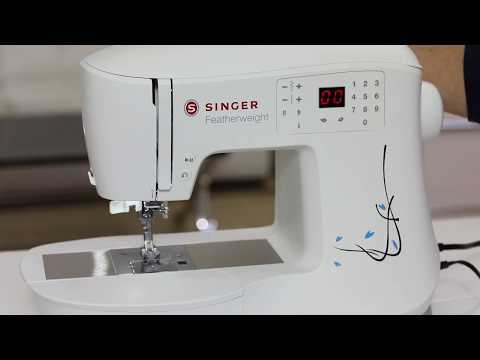 The Featherweight C240 sewing machine is great for sewing in small spaces or for taking to sewing classes! Sew all kinds of fabrics: from sheer to denim – even leather, thanks to the Integrated Even Feed System which feeds fabric evenly from both the top and bottom, so you can sew even difficult fabrics with confidence. Seams in napped fabrics like velvet and corduroy, as well as quilt layers, won't shift. Sewing over thick areas like hems in jeans is a breeze. Engage the Programmable Needle Up/Down button to have your needle stop down in the fabric, which is great for applique, pivoting around a pocket corner or free-motion sewing. There is a Speed Control so that you can set the machine's maximum speed – slower for more intricate projects or faster for larger projects like curtains, duvet covers and more. Your selected stitch appears on the LCD screen, and by pressing the Info Button, the machine even advises you on which presser foot to use for that stitch. The Top Drop-in Bobbin is transparent, making it easy to monitor thread supply so you won't run out of thread in the middle of a seam! An online Owner's Class Video is available to view anytime as well. One-Step Buttonhole (3)Buttonholes are sewn in one easy step. Just place the button in the buttonhole foot and the machine sews a buttonhole perfectly sized for that button, delivering consistent results every time. Integrated Even Feed System [IEF] (+)Fabrics feed evenly from the top and the bottom, allowing you to sew all kinds of fabrics, including multiple layers and bulky seams. Lightweight fabrics won't pucker, stripes and plaids will match perfectly and quilt layers won't shift. Achieve perfect 1/4” seams for quilt piecing and more. The foot’s outside edge provides a 1/4” seam allowance; inside edge provides a 1/8” seam allowance. The foot’s center guide rides smoothly over the seam as you sew for perfect stitching “in the ditch”. Provides an unobstructed view of the stitching area. Perfect for appliqué, decorative stitches, and surface embellishment. For Featherweight™ C240. The clear view through the foot provides visibility to precisely align rows of stitching. For free-motion quilting, thread painting, monograms, and even repairing holes. Perfect for joining lace or fabric edges together. Embellish projects with 4mm wide strings of pearls or beads. The slick surface on the foot's underside allows for effortless glide on tricky fabrics such as leather, plastic, and vinyl. Create unique surface embellishments. Fits the Featherweight C240.